The World’s Easiest and Most Economical Resurfacing System! Flexible waterproof overlay system for patio to roof deck. What is RubberDecky used for? This is a system that combines nano-technology with industry proven resins to form a unique, flexible shield from wear and tear as well as the elements. You can apply RubberDecky using a roller or brush. Doesn’t require special equipment to install. 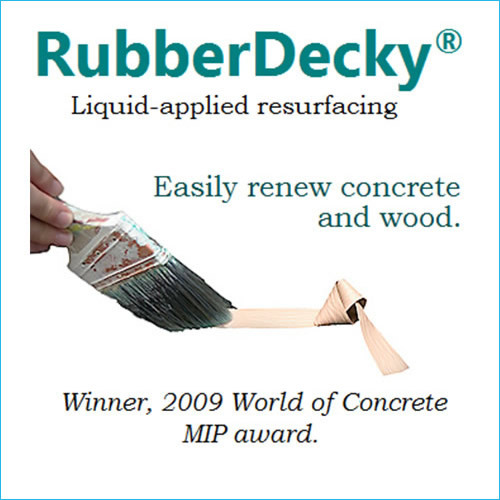 RubberDecky can be applied using a brush, roller or trowel or roll. RubberDecky is the only overlay system you will ever need. RubberDecky adheres to just about any type of surface including concrete vertical walls and flat work, decking and roofing. Its virtually weightless nature makes it the perfect system for application on vertical walls as well as horizontal surfaces. RubberDecky is a non-toxic system that is odor-free when applied, making it the perfect system for indoor or outdoor applications. If you’re looking for a system that is affordable, you can’t go wrong with RubberDecky. This system provides an attractive finish that lasts for years. RubberDecky will help you achieve a cool deck that meets the Prop. 65 and Energy Star guidelines. You don’t have to be a pro to apply RubberDecky. The system is easy to apply and requires no special tools to do so. There is no need for special surface prep either. All you need to do is ensure that the surface is clean and dry. If you’re on a tight budget, you can achieve great results with RubberDecky. You won’t have to compromise on quality. If you want to achieve a completely waterproof surface, apply RubberDecky over the PerfectMembrane system. Winner of CMP Magazine’s 2009 Readers Choice Award, Best Product Of The Year!